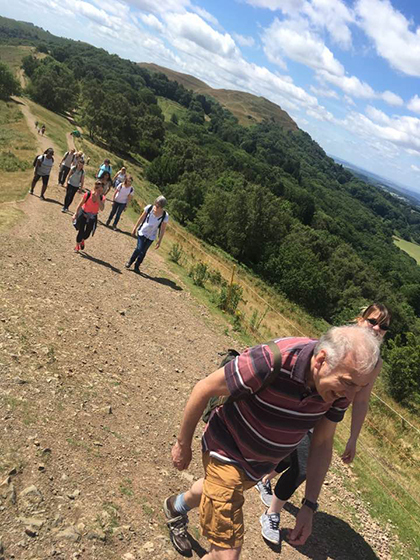 Staff, students and parents from The Sixth Form College, Solihull trekked the Malvern Hills last weekend to raise money for an impoverished school in The Gambia. A group of students have joined the College’s Team Gambia project, which will see them volunteering at the Jungkung Jemous Memorial Nursery and Lower Basic School in Abuko, Gambia at the end of the year. They have been spending the months leading up to this trip fundraising for the school. Some of the students who are going on the trip, together with staff and parents, met up in Worcestershire to complete a 10-mile trek along the tops of the Malvern Hills, starting from British Camp and heading to Worcestershire Beacon. They completed the walk on Sunday 2 July during beautiful sunny weather and everyone completed the challenge despite steep hills and warm temperatures. More than £1500 was raised in sponsorship. The Team Gambia project was set up by Peter Evans from Hamstead Hall School in Handsworth Wood. The College joined their project in 2013 and this winter’s trip to The Gambia will be the fourth visit by students from the College. Their week in The Gambia will see students teaching young Gambian children at the school. However, the project also tasks students with fundraising too and each student has a target to raise £400 each. Last year, staff and students raised more than £12,000.